In September 1923, Tokyo became a hell on earth. In less than three days, a magnitude approximate 7.9 earthquake and subsequent conflagrations reduced nearly half of Japan’s capital to a blackened, rubble-filled, corpse-strewn wasteland of desolation. The human tragedy of over 120,000 killed and 2 million left homeless was matched in severity by the economic cost of the damage inflicted: it was roughly four times larger than Japan’s national budget of 1923. The disaster did more than destroy. It also compelled reflection and inspired dreams that transformative and lasting changes might result. Many hoped that a grandiose, awe-inspiring capital could be forged from the crucible of catastrophe. Others conjured up plans for the construction of an infrastructure rich city that would allow the state to better manage its citizens. Still others suggested that moral, economic, and spiritual rejuvenation efforts spurred by reconstruction could be used to arrest the perceived degeneration of society. How did people experience, understand, and interpret the calamity? What inspired these dreams and did they eventuate? Was the urban landscape of Tokyo or the moral, ideological, and economic underpinnings of society transformed by this nation’s worst natural disaster of the modern era? Or, were these opportunistic dreams for rebirth more illusory than real? Were they chimeric in nature? How and why did numerous elites attempt to harness subsequent reconstruction programs to not only rebuild the capital, but also to reconstruct the nation? How did Tokyoites respond to such overtures? Were any lessons learned from this tragedy? Rather than transform Tokyo or the nation, the disaster amplified deep-seated fears about modernity. Moreover, starry-eyed and ambitious reconstruction visions exacerbated ideological tensions within Japan and fostered intense political contestation. Both restricted the grandiose dreams of reconstruction opportunists. My findings challenge widespread assumptions that disasters create “blank slates” or that they unite stricken societies. Utilizing a rich array of vivid source material, this website introduces key aspects of Tokyo’s destruction, the tragedies and hardships suffered by so many of its inhabitants in the aftermath, and the eventual reconstruction of Japan’s imperial capital. 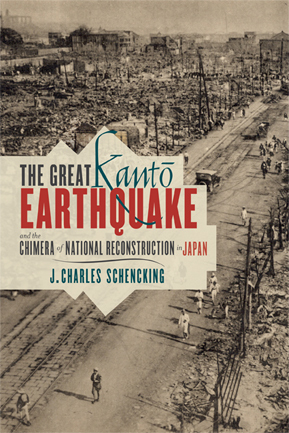 The large number of images, maps, and diagrams here and in the linked image archives available on this site serve as an ideal companion to The Great Kanto Earthquake and the Chimera of National Reconstruction in Japan (available on Amazon). This website is also intended to serve as a companion to two courses that I teach at the University of Hong Kong. One is a first-year, university wide Common Core course entitled Catastrophes, Cultures, and the Angry Earth. The second is an upper division history department seminar entitled The Great Kantō Earthquake and the Reconstruction of Tokyo. These courses introduce students to a wide range of translated primary historical documents as well as emotive visual materials associated with the 1923 catastrophe and reconstruction of Tokyo. The creation of this website is a direct result of a University of Hong Kong Teaching Development Grant secured in conjunction with the two courses listed above. This book is the first study to explore how people experienced, interpreted, and attempted to use the Great Kantō Earthquake of 1923 to not only rebuild Tokyo to reflect a new urban modernity, but also to reconstruct society. Utilizing a rich array of Japanese documentary material and extraordinary images, this study seeks to transform our understanding of Japan’s most deadly natural disaster in history and also helps us understand better why post-disaster reconstruction dreams in the world today often prove more illusory than real. Copyright © 2013 Great Kanto Earthquake.com. All Rights Reserved.